Combining fiction with zoological information, in A Whale’s Tale, Daniel S. Janik explores the undersea world of the Pacific Humpback whale. 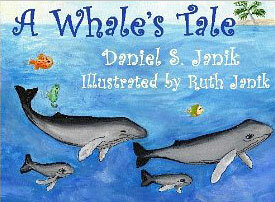 The book is described on the back as a “Read-Aloud, Color-Me-Please Book.” It follows a particular whale from his birth until he begins his own family. The idea for this book is a noble one: to interest children in the natural world through a character with whom they can identify. The narrative, however, could pose problems for young readers, whether they’re reading it themselves or listening to an adult. Some of the vocabulary, for example, such as “inseparable” or “increasingly tolerant” might be above them. More problematic, though, is the structure. At the beginning of the tale, it is unclear who is speaking, but it turns out to be the whale who would eventually become the young humpback’s mate. It would have been better to tell the whole tale from the main character’s perspective. Since the story is told from a whale’s point of view, it downplays scientific terminology and describes things from a sensory perspective. For example, it describes the phenomenon known as “bubble net feeding,” where whales combine forces to blow bubbles around small fish, which then confine the animals in a small area where they can easily be scooped up. However, for young people unfamiliar with this technique, an appendix or a sidebar describing the process in clear terms would have helped. Ruth Janik contributed the illustrations, and her cover art is beautiful. It’s too bad the interior art could not also be produced in color. In addition to featuring the central characters, the book also includes other sea life, including an incongruous mermaid. Since these other fish and sea creatures are not mentioned in the story, a caption containing some information about them would have added to the learning experience. While this story may interest children initially, there is little action aside from migration and feeding, so that might discourage repeated readings. Still, any tale that could help young readers appreciate the environment should be lauded, if for that spirit alone. Disclosure: A review copy of the book was provided by the author.